Recently two parishes that once were widely associated with the celebration of the Traditional mass were back in the news. In both cases we at the Society of St Hugh of Cluny have been involved with “Extraordinary form” Masses at these churches. At Our Saviour’s, we sponsored the celebration in 2007 by Father George Rutler of the first Traditional mass pursuant to Summorum Pontificum in the Archdiocese of New York. 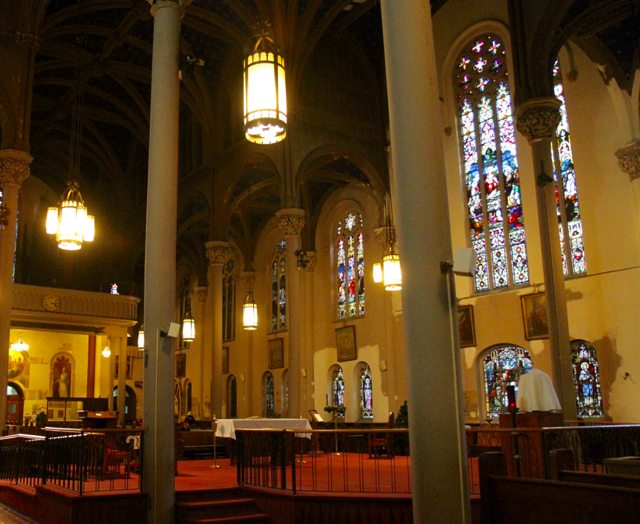 More recently, at St. Agnes we co-sponsored several Traditional Requiem Masses. 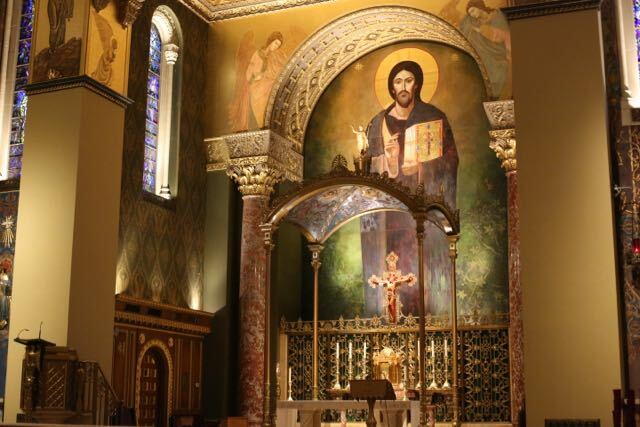 Last week, a very conservative Catholic friend who had been involved in the protests (over the removal of images from the church – SC) met personally with Father Robbins, and tells me that we who had objected to his taking down the images had been wrong. I can’t give details of what was a private conversation, but I know this friend to be quite conservative in his views. If he has changed his mind on this issue, I will accept that, and hereby apologize to Father Robbins. I promised confidentiality to my source, so I can’t say more. My point was that it was factually incorrect to blame Father Robbins for removing them. I can’t say more than that, though. So an allegedly “very conservative” fellow has a chat with Fr. Robbins, and based on this conversation – which of course cannot be disclosed – we learn that those who objected to Fr. Robbins’ actions were “wrong” – or at at least that Robbins was not at fault for removing them. Mr Dreher may have severed his relationship with the Roman Catholic Church, but the legacy of Ultramontane clericalism remains strong in him. In the comment box, “CatherineNY,” a frequent online partisan of Fr. Robbins, chimed in. She(?) first shifted the onus for shutting down the Traditional mass at Our Saviour’s to Catholic Traditionalists and the prior pastor. You see, they were unable to muster more than fifty people each Sunday for a mass celebrated by a “celebrity priest.” (Note the zinger directed at Fr. Robbins’ predecessor). So the whole movement is a failure. Now, that in New York City other Traditional masses were and are celebrated each Sunday (and Holy Day)in addition to that at Our Saviour’s – and with with greater attendance – seems to have escaped “CatherineNY;” she later admitted she knows nothing about the frequency of Traditional Masses in the Archdiocese. Need I add that the remark about “celebrity priests” shows she is equally ignorant of the motivating forces behind Catholic Traditionalism? 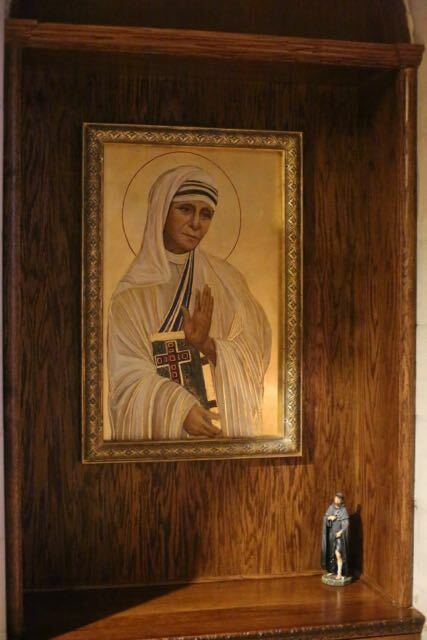 But more interesting was “CatherineNY’s” assertion that the “stripping of the icons” at Our Saviour’s was part of a grand plan to replace them with art from St Stephen’s – Fr. Robbins’ recently closed other parish. That notion contradicts both reported facts and the public statements of the pastor of Our Saviour’s. But it is true that artwork from St Stephen’s has been making its way over to its neighbor on Park Avenue. 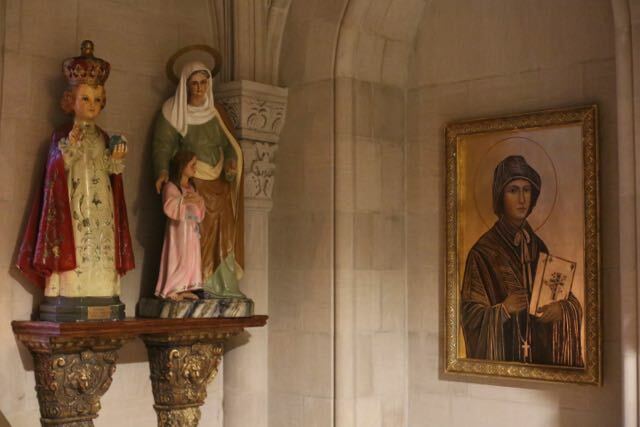 In fact, recently a special celebration took place of the “dedication” of stations of the cross removed from St Stephen’s – in the presence of an auxiliary bishop and covered in a fawning report in Catholic New York. The stations are described as the work of Brumidi, the artist who created the huge frescoes in St Stephen’s. According to the published sources I have, the stations are “attributed to” Brumidi or by Brumidi “and a collaborator.” Indeed, unless it is just the difference between the media, they seem to me to be in several respects more sophisticated than Brumidi’s acknowledged work. So let’s take a look at the current state of affairs at Our Saviour’s – which is very much still a work in progress. The color of the outer pillars has been toned down from bright white (after the stripping away of the icons). Gilt statuettes have disappeared from this altar (of the Sacred Heart). The font is from St. Stephen’s. (Above)Newly installed furnishings (from St. Stephen’s?) 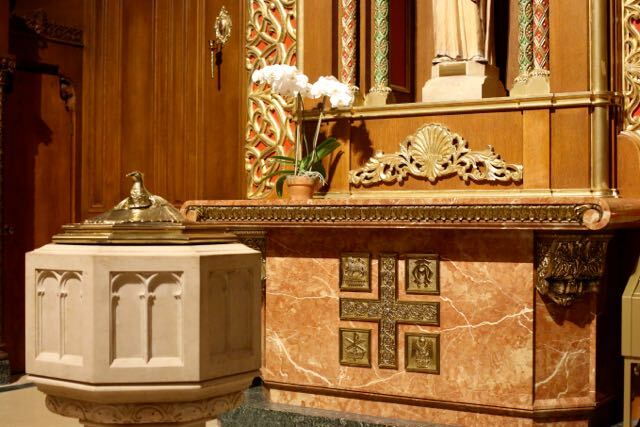 in a former confessional indicate the location of the baptismal font is intended to be permanent. 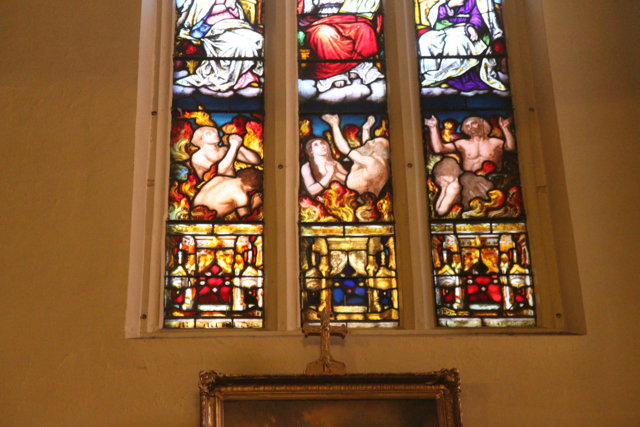 (Above and below) The stations of the cross from St Stephen’s – newly cleaned and restored. 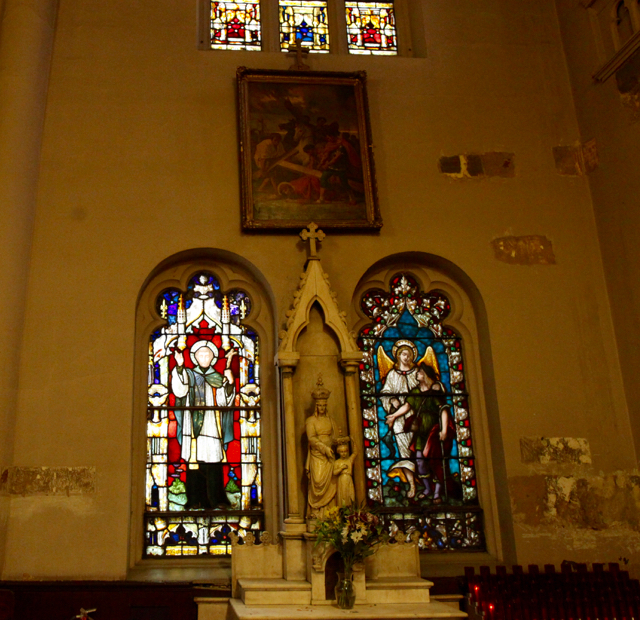 (Above and below) The same paintings in their original home of St Stephen’s – darkened with age and neglect, but more in harmony with the scale of that much larger church. 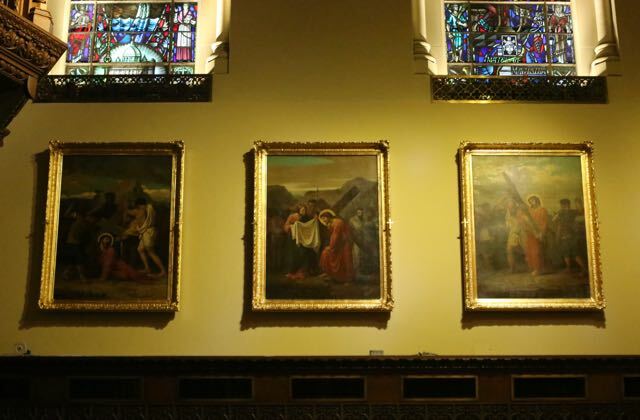 (Above) In St. Stephen’s the stations of the cross had a difficult time competing for attention with the huge windows, altars and frescoes – especially given the indifferent lighting. (Above) Do you notice something that has gone missing in the transition to Our Saviour’s? 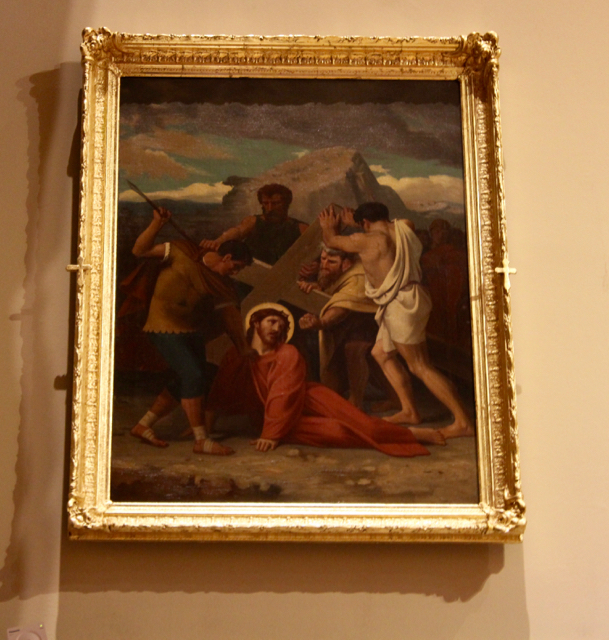 The newly restored paintings obviously make a splendid appearance in the much brighter surroundings of Our Saviour’s – the original 1960-era stations of the cross in Our Saviour’s were pseudo-modern junk. To my taste, however, they are a little out of scale in this much smaller church. 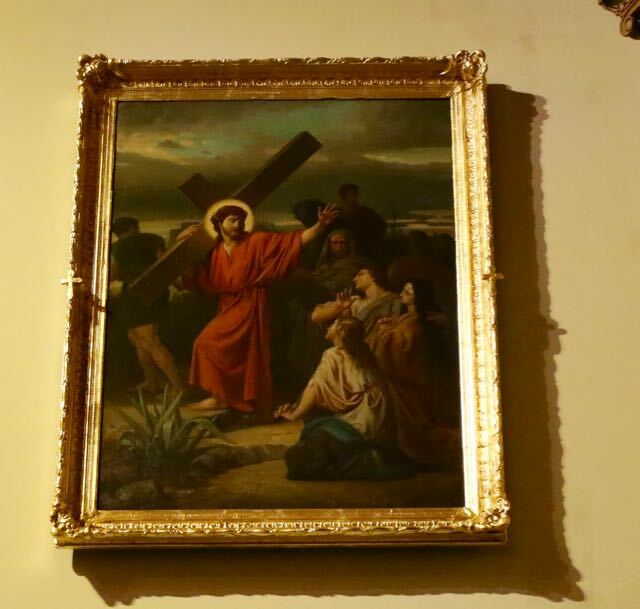 If you actually want to pray the stations of the cross, it’s better to do it from the center aisle – from the side aisles you have to crane your neck to see the paintings. (Above) The baptistry recently has become that quintessential Novus Ordo institution: a “statue room” tucked away somewhere out of sight for the private devotion of “those who care for that kind of thing.” It features cheap statues and statuettes – probably from St Stephen’s (but originally from Our Lady of the Scapular?) – and two paintings of Ken Woo – now framed( and slightly cut down?) 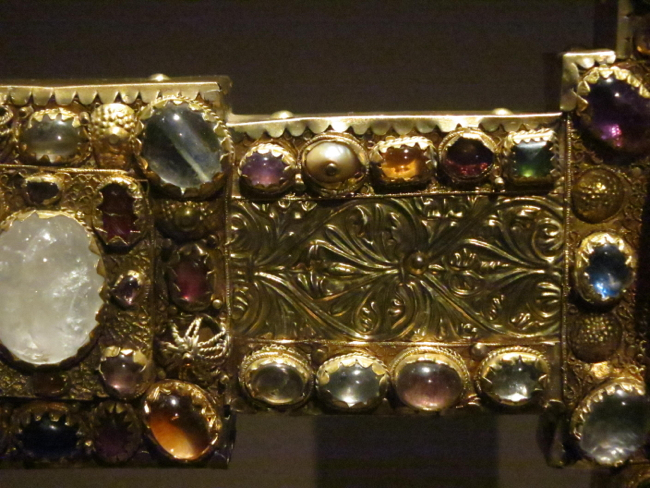 – which were formerly attached to one of the rear pillars in the sanctuary. 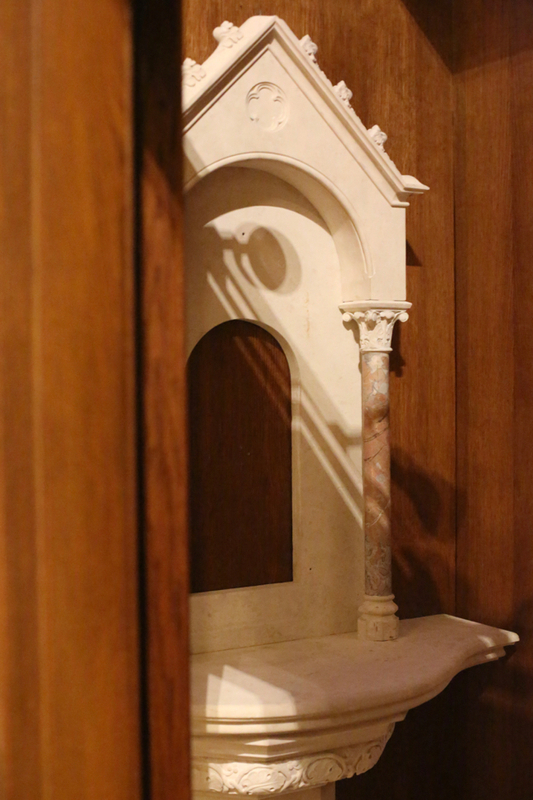 (Above) The doors of the baptistry now frame a side exit from the narthex/vestibule. 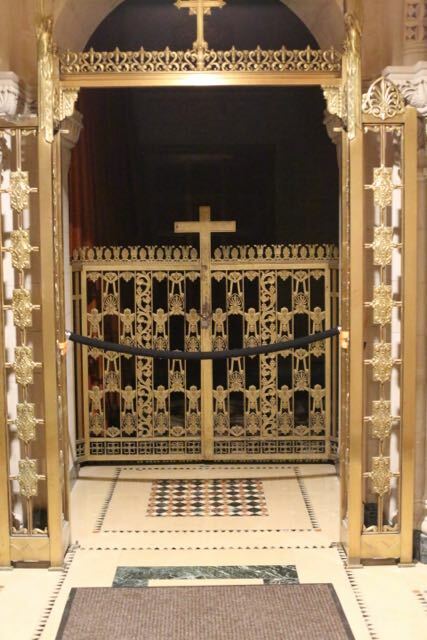 The former baptismal font (from St Ann’s church and restored at considerable expense by the prior pastor) was last seen a few weeks ago stowed away behind these gates. As you can see from the above, the “restoration” activity at Our Saviour’s has taken a totally different direction from the previously announced objective of “restoring the original appearance.” Now, with its “Conciliar” statue room and baptistry situated in the nave – and furnished with a growing collection of all kinds of good and not-so-good art – the church is beginning to resemble more an old time New York parish with its jumble of heterogeneous decoration accumulated over many years. There seems to be no central goal – unless it is eradicating the work of the previous pastor…. 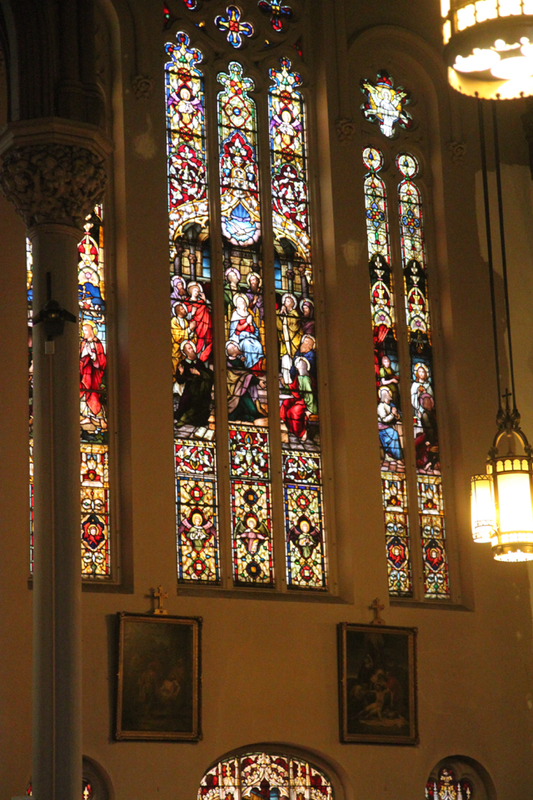 Did you know that to keep the staff paid, the doors opened and the building functioning at Our Saviour, it costs $2,037 every day, 365 days a year and $1,012 per day at the Chapel of the Sacred Hearts of Jesus and Mary? Our only source of income is what you put in the collections. The weekly collection at Our Saviour should be $14,000+ and at Sacred Hearts $8,000+. Would you prayerfully consider an offering of one hour’s wage to help the needs of your parish? The final decisions about parish mergers were implemented 1 August 2015. St. Stephen – Our Lady of the Scapular and the Chapel of the Sacred Hearts of Jesus and Mary were merged with the Parish of Our Saviour. 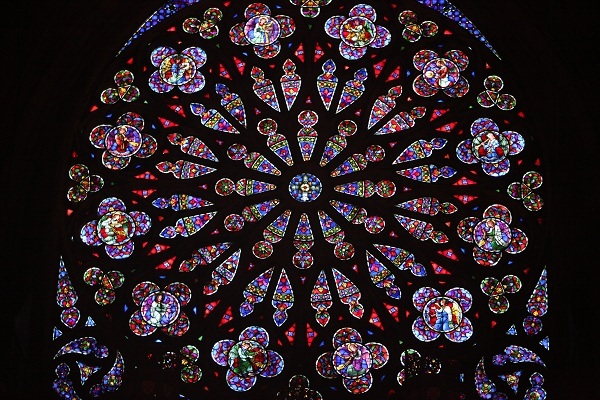 The next step in the overall plan is for each of the merged parishes to decide whether or not the second worship site is needed going forward. Pastors have received guidelines as to how present Mass attendance is to be figured into the scheduling of Masses going forward. While attendance figures have remained steady at Our Saviour, attendance at the Chapel of the Sacred Hearts of Jesus and Mary is not as strong as it should be. Presently, an average of twenty people attend weekday Mass at the Chapel. The Sunday 12:45 p.m. Mass has grown and is strong but the 5:30 p.m. Mass on Sunday is dwindling. This can be due to a number of factors including the Mass Schedule at our neighboring parishes, Epiphany and St. Agnes. No decisions or recommendations have been made as of yet but we certainly need an increase in attendance at daily Mass and the 5:30 p.m. Mass on Sunday. The collections are following the attendance trends. The more intriguing question is whether the St. Agnes Latin Mass will continue. I think it is safe to say that Opus Dei does not view the Traditional mass as central to their apostolate. 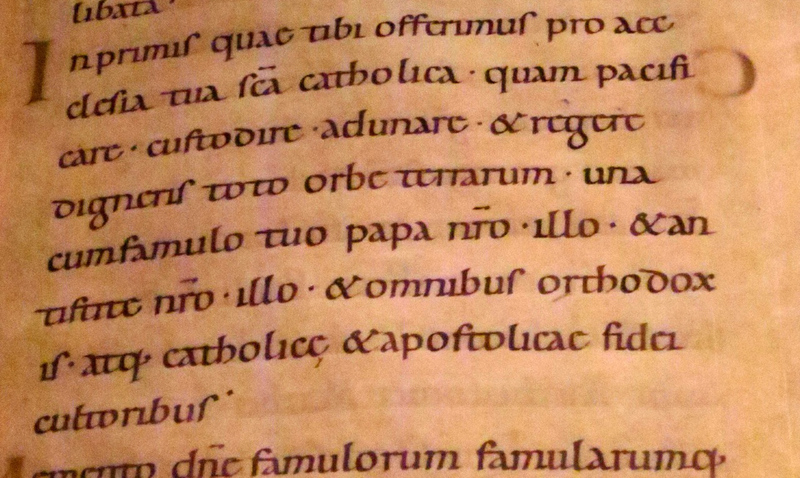 For example, it does not appear on the mass schedule of ST. Mary of the Angels. I am told, however, by a reasonably well-informed individual that he has it on the best of authority that the Traditional Mass at St Agnes will continue. Two parishes, two Traditional masses. 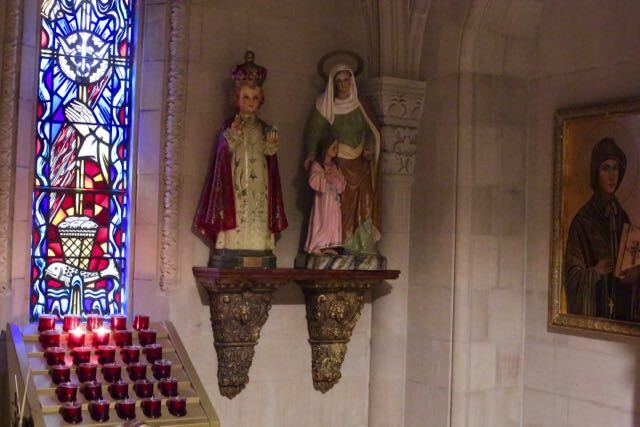 St.Agnes and Our Saviour illustrate the dilemma of Catholic conservatism and Traditionalism – especially after Summorum Pontificum – in the Church today. Here were two churches that profiled themselves as champions of doctrinal Orthodoxy and Catholic artistic revival. Both added the celebration of the Traditional mass to their schedules – not as the central feature of their apostolates but as a welcome component of Catholic tradition. Both acquired a national reputation. Yet in both cases subsequent personnel moves largely undid or marginalized these accomplishments. Traditionalists and conservatives have to face the reality both of an administration indifferent to their objectives and of ideologically motivated enemies always having the possibility of gaining the upper hand. Would it have been different if the parishes had indeed centered their liturgical life on the Traditional mass? A center of gravity independent of the personality and whims of the pastor? We do not know! What we have learned however, is that Catholic Traditionalism survives and thrives where it takes central place in the parish and is celebrated with the maximum care in ceremony, music and preaching.